1 1/8" (28.6 mm) clamp on. (This is the traditional, standard type for most road bikes and older MTBs. 1 1/4" (31.8 mm) clamp on for mildly oversized seat tubes. 1 3/8" (34.9 mm) clamp on for oversized seat tubes, common on aluminum frames. "Braze-on" units mount on a special slotted tab, which may be brazed, bolted or glued onto the frame. "E-type" Shimano units have a bracket that is held on by the bottom bracket retaining ring. These also use a special braze on to stabilize the derailer. Traditional front derailleurs are "bottom pull", operated by a cable running up from the bottom bracket area to the derailer. "Top pull" derailleurs are operated by a cable running down from above. This design is mainly used on mountain bikes, with the intent of avoiding running the cable under the bottom bracket, where it is exposed to spray kicked up by the front tire. Some older designs use a loop of cable housing running from a stop near the bottom of the down tube. This design hasn't been used since the mid 1970s, but we stock a couple of derailer models that are compatible with this cable routing. Front derailleurs shift best when they are mounted as low down as is possible without having the cage foul the teeth of the chainrings. In particular, the bottom edge of the outer cage plate should be closely matched to the curvature of the largest chainring. If you use a front derailleur with a larger ring than it is meant for, the rear of the cage will get too close to the chainring before the front of the cage is close enough to provide crisp shifting. If you use a front derailleurs with a smaller ring than it is meant for, the front of the cage will get close to the chainring while the rear of the cage is still far away from it. This won't hurt shifting, but will require excessive "trimming" of the front derailer as you change gears at the back. Mis-matched derailleurs/chainrings may be satisfactory with friction shifting, but will likely cause problems when used with indexed shifters, such as Shimano STI units. If you have unusual gearing requirements, and are handy, you can re-shape the outer cage plate with a grinding wheel to match a non-standard large chainring. Modern derailleurs are optimized for either double or triple chainwheels. The shape of the shifting cage is tailored for the application intended. "Double" front derailleurs have inner cage plates that extend down slightly farther than the outer plates. "Triple" front derailleurs have extended inner plates that go down considerably lower than the outer plates. "Double" front derailleurs will work with triples, but if the middle ring is much smaller than the big ring, they will be balky shifting up from the small to the middle chainring. They do, however, work well with "half-step-plus-granny" setups, where the middle ring is only 3-5 teeth smaller than the outer ring. "Triple" front derailleurs may have interference problems between the extended inner plate and the inner chainring. 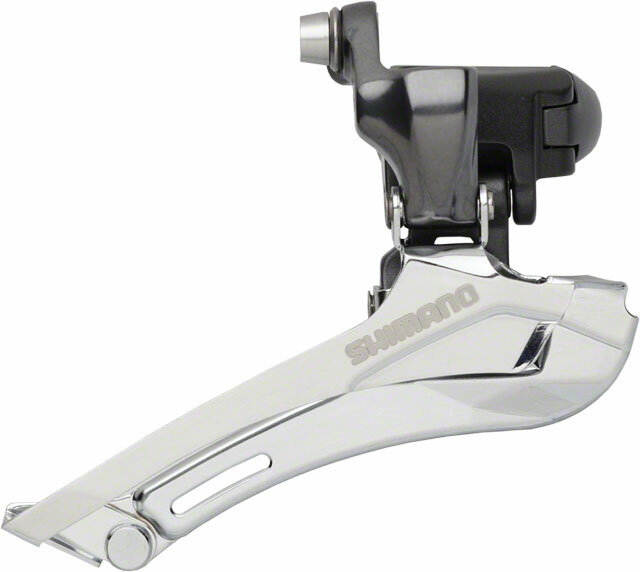 The ratio of cable movement to derailleur movement differs with Shimano's "road" vs. "MTB" front derailleurs. This can cause indexing problems if you use a "road" front derailleurs with upright handlebars or a "MTB" front derailleurs with drop handlebars. For more on front derailleurs, adjustment and troubleshooting, see my Derailleur Adjustment Article. 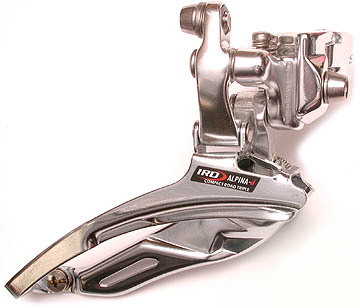 and compatible with Shimano "road" (drop handlebar) STI shifter indexing. 1 1/8" or 1 1/4"
Designed for cyclocross but works great for double & triple cranks with smaller chainrings. Works with Shimano STI.